The hiding spots for the particles making up dark matter are narrowing, and the answer to this cosmic mystery could come within the next three or four years, scientists say. Dark matter is an elusive substance that is invisible and almost never detected, except by its gravitational pull. Yet astronomers say it likely makes up a quarter of the entire universe and dwarfs the amount of normal matter (galaxies, stars and planets) out there in space. Just last week, particle physics discovery from the Large Hadron Collider in Switzerland cast doubt on a theory called supersymmetry, which predicts the existence of particles that are among the leading candidates for dark matter. That finding limited the types of supersymmetric particles that can exist, but didn't take the supersymmetry explanation off the table completely. "I think we're looking in enough different ways that unless it's something that we just haven't thought of at all yet, it seems to me we're very likely to find it within the next decade," said Dan Bauer, a physicist at the Fermi National Accelerator Laboratory in Illinois working on one of the experiments, called CDMS. The leading experiments aimed at detecting dark matter are just starting to operate at sensitivity levels thought to be sufficient to detect signals from these particles, and their results should be in within about three or four years, Bauer said. "If we don’t find it in this next round of experiments, I think everyone will be a bit discouraged," Bauer told SPACE.com. To be dark matter, the potential particles must all be neutral and stable, and interact very rarely with other types of matter. Several experiments are underway to search for WIMPs by placing large masses of material, such as xenon or germanium, deep underground and shielded by many layers of protection aiming to keep all other particles out. If any particles do make it past these barriers and collide with the atoms in the xenon or germanium, they will very likely be WIMPs, the thinking goes. CDMS (which stands for the Cryogenic Dark Matter Search), started in a tunnel underneath Stanford University in California, and a newer, more sensitive version of the project is now underway even deeper underground in Minnesota's Soudan Mine. Another WIMP-hunting experiment is called XENON100, the latest iteration of a search based at the Gran Sasso underground laboratory in Italy. And a new project called LUX (the Large Underground Xenon experiment) under construction at the Homestake mine in South Dakota could be a big player, too. Having all these competing projects is ultimately necessary, if any result is to be believed. "Most people in the field agree you're going to need to see evidence of this in more than one experiment and more than one type before everyone's convinced," Bauer said. And WIMPs aren't the only candidate particles for dark matter. Another potential solution to the problem is called the axion. This is a theorized particle that is also neutral and weakly interacting, but might lighter than WIMPs. Therefore, if axions are dark matter, there would have to be a lot more of them around. An experiment called the Axion Dark Matter Experiment (ADMX) at the University of Washington uses a large superconducting magnet to search for these particles. So far, that search has turned up empty as well. And an even weirder explanation for dark matter comes from the idea that there are tiny hidden dimensions wrapped up inside the known four dimensions of space-time in our universe. 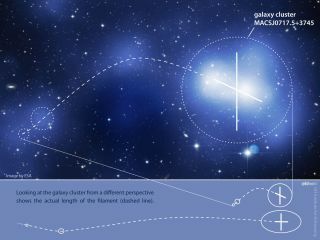 If that's the case, there could be accompanying particles called Kaluza–Klein particles that account for dark matter. However, these would be even harder to detect. And it's too soon to rule out even more the unlikely sounding explanations. "The things we thought were higher probability haven't shown up yet, so we should keep an open mind," said theoretical physicist Lance Dixon of the SLAC National Accelerator Laboratory in California. Despite the difficulty of finding dark matter, whatever it is, physicists say they're not discouraged. "I'm pretty confident that dark matter is real, and it seems attractive for it to be carried by an elementary particle, although I could think it might not be exactly that way," Dixon said. "We might not be lucky that the elementary particle that is one that is within the realm of detection." Bauer said he's been working on CDMS for a long time, and admitted to thinking, at first, that he would have found something by now. "I guess it’s the natural optimism of physicists to think this is something we might actually be able to find," he said. But even if his experiment never detects dark matter, that in itself tells scientists something interesting. "It would be more exciting if we saw it than if we didn’t, but it's an important result either way," Bauer said.